Sen. Marco Rubio hinted in an interview Tuesday that his fellow Republicans might take advantage of the fact that Congress will need to pass a spending bill this fall to block President Obama from taking executive action on immigration. "There will have to be some sort of a budget vote or a continuing resolution vote, so I assume there will be some sort of a vote on this," Rubio, a Florida Republican, told Breitbart, a conservative news organization, in an interview. "I'm interested to see what kinds of ideas my colleagues have about using funding mechanisms to address this issue. Beyond that, I'm not sure if the president is going to make this decision before we go back or after." Although most Republicans oppose the idea of the president unilaterally deferring deportations or expanding work permits for immigrants in the U.S. illegally, they're not all on board with the idea of using the threat of a government shutdown to make their views known so close to the midterm elections. House Budget Committee Chairman Paul Ryan, R-Wis., said in an interview with CQ Roll Call last week that the House would pass a "clean" continuing resolution, or spending bill, to keep the government open this year. "If for some reason the Democrats don't take that, then they will clearly have shut the government down," Ryan said. "It will be patently obvious ... that they are playing politics with this, and trying to trigger a shutdown so they can blame us, but we're really blameless in this particular situation." Of course, it takes only a small minority of politicians to gum up the works of government. The 2013 government shutdown occurred at the behest of a small group of conservatives who were looking for ways to defund the Affordable Care Act. According to the timeline laid out by the president's aides, Mr. Obama will make an announcement by the end of summer on any changes to the immigration system or its enforcement. Rubio wrote the president a letter Tuesday saying he was "increasingly alarmed by news that your administration is considering sweeping executive action to give work permits to millions of people here illegally." "If indeed you move forward on such a decision, I believe it will close the door to any chance of making progress on immigration reform for the foreseeable future," he said. 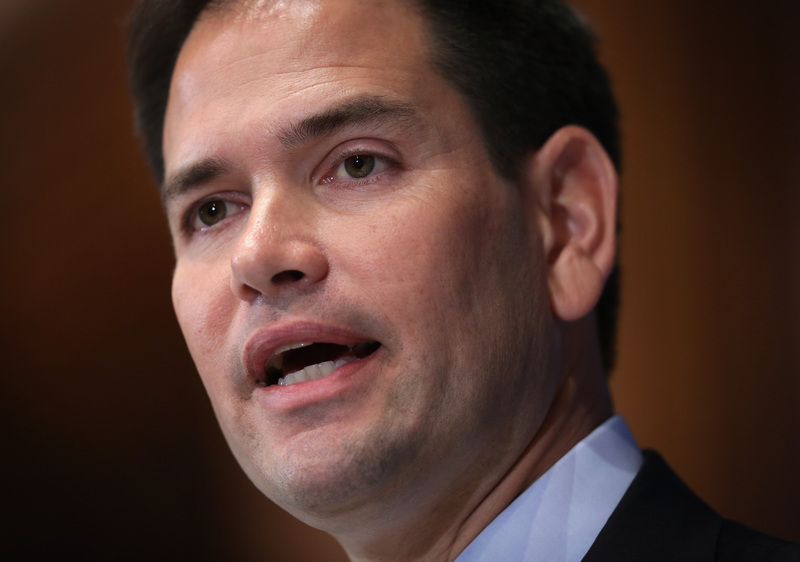 Rubio was one of the four Republicans who helped author the comprehensive immigration reform package the Senate passed last summer, which included additional funds for enforcement, changes to the legal immigration system and a conditional pathway to citizenship for certain immigrants in the U.S. illegally. Amid falling poll numbers, the potential 2016 presidential candidate has disavowed the bill and instead argues that any reforms need to be made in stages, starting with even more aggressive enforcement that includes expanding the use of employment verification and an entry-exit tracking system for visas. "It's abundantly clear to me that after being involved in this for a year these people don't want to talk about what to do with those who are here illegally until they believe the problem has been brought under control and they want to see it happen first," Rubio told Breitbart. "They don't want to hear about how it's going to happen--they want to see it happen." He blames the Deferred Action for Childhood Arrivals (DACA) program instituted by the president in 2012 as a major impediment for immigration reform, and blames the administration for encouraging a wave of illegal immigration from Central America in recent months, especially children. "I understand that you inherited a broken system created after years of poor decisions made by both political parties in Washington," Rubio wrote to the president. "But the cumulative result of six years of your administration's approach on immigration reform is that, for all intents and purposes, America no longer has an immigration system. Instead, we have unsettling chaos." He urged Mr. Obama to resist the "tremendous political pressure" from activists to expand deportation relief, arguing it will only encourage more illegal immigration and "significantly set back the prospects of real reform."